LONDON — Pope Benedict XVI will visit Scotland and England in September in a four-day visit combining preaching and diplomacy, Buckingham Palace announced Tuesday. British officials described it as an unprecedented "papal visit with the status of a state visit," though some of the usual trappings laid on for a visiting head of state will not be offered to the pope. An earlier visit by Pope John Paul II in 1982 was a pastoral visit only. During his visit Benedict plans to conduct a public mass in Glasgow's Bellahouston Park, where some 300,000 people swarmed a mass celebrated by Pope John Paul II during his pastoral visit in 1982. John Paul's visit was strictly to visit his flock — rather than as a head of a state — although he was received by the queen at Buckingham Palace. In England, Benedict will preside at the beatification of Cardinal John Henry Newman in Coventry; in London he will give a speech to leaders of civil society, join leaders of other churches for an ecumenical service at Westminster Abbey and call on Archbishop of Canterbury Rowan Williams at Lambeth Palace. He will not visit Wales, church officials said. Further details of the papal itinerary will be released later. "A defining feature of Pope Benedict's teaching has been to remind Europe of its Christian roots and culture and to give us guidance on the great moral issues of the day, and it is my hope that we'll open our hearts to his words," said Scottish Cardinal Keith O'Brien. 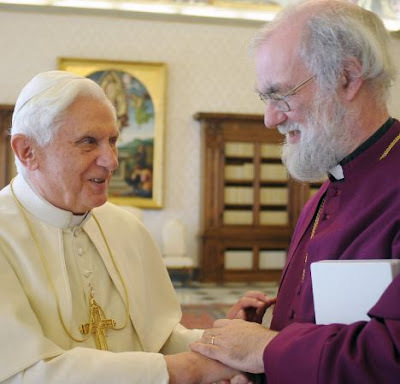 Archbishop Vincent Nichols, leader of Catholics in England and Wales, told reporters that he didn't know whether Benedict planned to address the issue of child sexual abuse within the church. Scottish Secretary Jim Murphy said the pope's visit would cost taxpayers about 15 million pounds ($22.5 million) in addition to police costs, which will come from existing budgets. Murphy contrasted that to the 19 million pounds cost of staging a one-day G-20 summit in London. Newman's beatification marks the first time in Benedict's papacy that he has personally presided at the creation of a new saint. Newman's journey from being a Church of England priest to becoming a prince of the Catholic Church has a particular relevance now, since Benedict has invited traditionalist Anglican clergy to join a special structure which would allow priests — including married men — to keep certain Church of England rites within the Catholic fold. It remains to be seen how many Anglicans will accept the invitation. Archbishop Williams, the spiritual leader of the world's Anglicans, welcomed the papal visit. "The pope's visit will be an opportunity to cement ties not only between the Holy See and the United Kingdom but also the Roman Catholic Church and other Christian churches in Scotland, England and Wales," Williams said. The Church of England and state churches in Scotland and Wales were created by King Henry VIII, who had been unable to gain the Vatican's consent to annul his marriage to Catherine of Aragon. The breach led to violent suppression of Catholics, and then Anglicans when Henry's Catholic daughter, Queen Mary, succeeded to the throne. Catholicism was vigorously rooted out in Scotland. The historian W.H. Murray has written that there were 39 Catholics and 43 anti-Catholic societies in Glasgow in 1798. Sectarian passions were slow to cool; they live on, for instance, in the intense rivalry between Protestant supporters of Glasgow's Rangers FC soccer team and Catholic fans of Celtic FC. Benedict's meeting with Queen Elizabeth II will be an encounter between two heads of state as well as two heads of churches. The Vatican is a state, and the queen is the supreme governor of the Church of England. Catholics still are forbidden to ascend to the throne. Britain did not resume official relations with the Vatican until 1914, and waited until 1982 to exchange ambassadors.